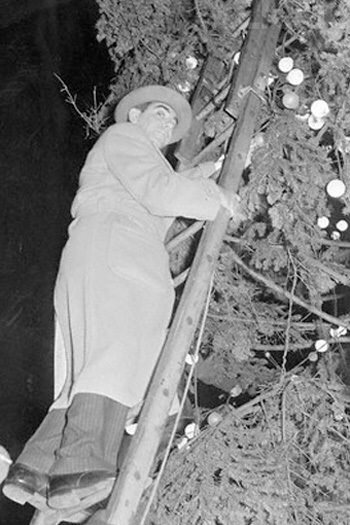 It is a disturbing to imagine "the man in black", the original host of radio's Suspense!, decorating for Christmas. The stockings hung on the hearth, each still containing a severed foot; a whithered brown tree topped with a shrunken head maybe? But even Suspense manages to get into the Christmas spirit in their own macabre way. Sometimes a Suspense! Christmas episode could be creepy enough to make even Santa hide under the covers! 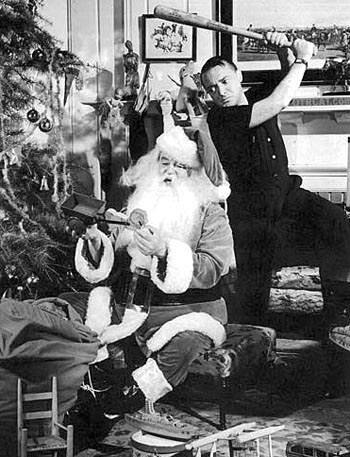 In 1943 we are treated to Peter Lorre in "Back for Christmas". Lorre plays a henpecked botany professor who is working on a "devils garden" in the cellar while his shrewish wife nags him to ready for their scheduled sailing for a lecture tour of America. Any Suspense fan will realize early on that there is going to be more than orchids buried in the basement, but it is her surprise Christmas present that will be the professor's undoing! Suspense would present this story twice more, starring Herbert Marshall first in 1948 using a very close adaptation of the script used by Lorre but under the title "Holiday Story", and again in 1956 with a rewritten and updated script. In 1944 we are treated to another very British story where an actor becomes fed up with the character that has made him famous, "The Brighton Strangler". The Strangler in the play begins his murderous spree on Christmas day. After quitting the production the actor gets a nasty bump on the head during the Blitz. Still disoriented, he finds himself on a train to Brighton, and receives an invitation to a Christmas party by a beautiful young woman. Will he be able to really leave his character behind? "Double Entry" presented in 1949 is a rebroadcast of a 1945 story. The earlier broadcast mostly missed the Christmas theme, but the altruistic spirit of the holiday shines in 1949, with a proper Suspense! twist! Eddie plays an honest book-keeper who takes a big risk to help a friend in need. Of course the risk backfires, pays off, and backfires again before winding up where he started, but what a ride on the way! Suspense always great success putting actors into roles far from their usual genre, and one of the most successful would be 1950's "Christmas for Carol" starring Dennis Day. Day achieved fame as the naïve young tenor from the Jack Benny Program. On Suspense! he is still a hard working and admirable young man, until circumstances force him into league with a desperate criminal. "Twas the Night Before Christmas" stars Greer Garson as a house keeper and guardian for a young girl who wants nothing more than to see her parents on Christmas eve, How can she tell the young girl that their plane has gone missing in a storm? This story was broadcast in 1951 and 1953. A much lighter (for Suspense!) Christmas story is presented in 1955 in "A Present for Benny", when a gangster decides to send a rival a present that goes "BOOM!" '55 also gives us the Christmas fantasy "The Cave", where a young boy finds a wonder world filled with pirates and adventure using a flashlight Christmas present. The Cold War joins Suspense for the Holidays in 1957. In "Dog Star" a Russian satellite lands near the home of a young girl who is desperate to get a dog for Christmas. And who do you suppose the passenger of the satellite is? We get great stories for both Christmas and New Years in 1958. 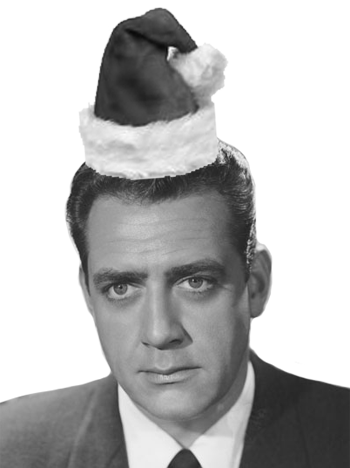 Raymond Burr is both chilling and heartwarming as a convict who receives an early parole, only to discover that the cop he swore revenge upon has married the con's former girlfriend. Dressed in a borrowed Santa costume, the con makes his move, only to discover that there are now children to consider. A week later Frank Lovejoy is a gamble desperate to pay off his debts when he comes into possession of a magic watch, a watch that can control time! "A Korean Christmas Carol" is a ghostly story of duty, dedication to comrades, and sacrifice, played out in the cold hills of a foreign land. The tale is told by an American soldier who has drawn frustrating duty in Korea in the years after the war. He takes on a passenger whose experience has been much different than his. We return to the theme of paroled convicts changing their ways through the spirit in Suspense! 's last Christmas. Sir Benjamin turns out to be a most mischievous ghost in "A Yuletide Miracle". But the ex-con he helps, and the family that get helped by the ex-con, all feel his presence. Christmas must have been an all around tough time for Suspense!, what with all the happiness and cheer of those prosperous post war Christmases. Producer William N. Robson spoke of the suspense in the story of the First Christmas, the mystery surrounding the star, and the climax and happy ending when the Three Kings of the Orient arrive bearing gifts of gold, frankincense, and myrrh. There was just no way for the Suspense writers to improve upon that story. See also: Comedians in Suspense, Christmas Mystery, and Best of Suspense. This order was received in good order and condition. I must mentioned that I appreciate you sending all your OTR files out on archive quality CDs, or some sort of equivalent. Not everyone knows the difference [compared to the low grade CDs you can get at Walmart]. Secondly, I scratch my head and wonder how you got the 'Anthology' radio series, and for that matter, who in the world had the whole series recorded. I know this series would be not to everyone's taste, but it sure hit my chimes. Surprisingly high quality programming in the twilight of the radio days - and a series that I had never heard of until I noticed it on your site. Thanks for locating this and making it available.